The Prom Dress was beyond beautiful. A skirt of cascading rows of coral chiffon, and a bodice with heavy rhinestone and “jeweled” embellishments! Of course, such an occasion calls for a Prom Purse. Of course, such an occasion also occurs when there is little or no time to create a Prom Purse. There are times a project must be declared “finished” not because the stitching and embellishment have reached a pleasing point – but simply because there is no more time! 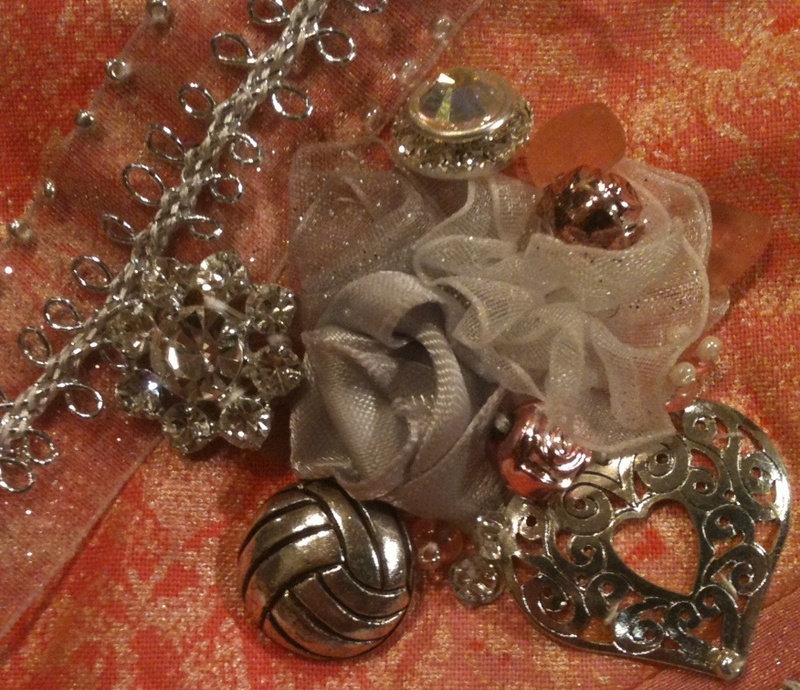 I also gathered every silver or rhinestone-bearing embellishment in The Stash. The monogram “F” was self-sticking, which would have been a nice time saver, but as it required infilling with extra beads, it was stitched as well. (FYI: removing Sticky Stuff from beading needles requires too much time!). 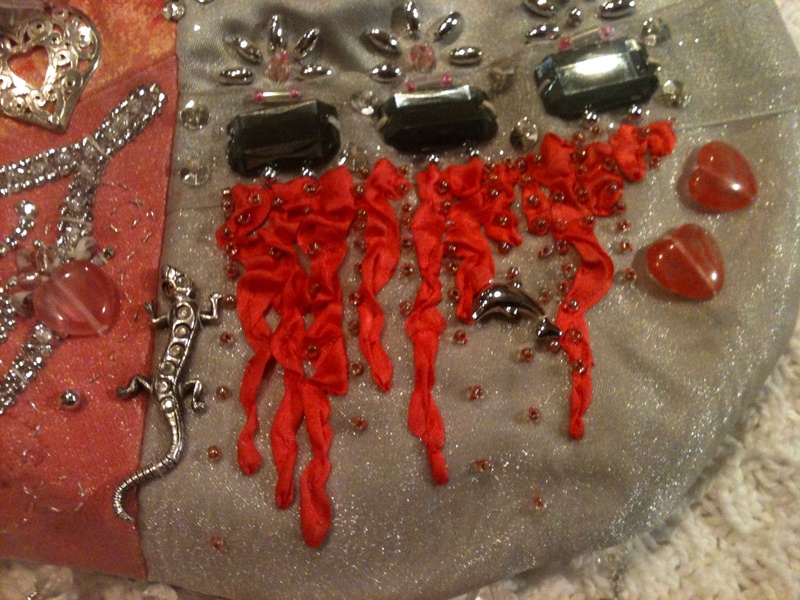 The Stash contains odd items – a rhinestone lizard among them! The daughter plays volleyball, so the volleyball charm was added! The ribbon roses were made following instructions here – but used ribbon rather than fabric as it was quicker. I wanted to add more, but time was running out. My “artsy” side wanted the cascading design of the skirt to be reflected in the purse. The silk ribbon used for the cascades is a dark coral color – although it appears quite red in the photo. Swimming among the cascades is a dolphin charm. As I stitched it on, I was wishing I could sew as fast as dolphins can swim! I often wondered what to do with those little bags of beads and sequins that come attached to garments! They added a bit more sparkle to the bag. It performed its function well. It held all the important items – cell phone, prom ticket, etc. It matched the beautiful dress and shoes. But if only there had been another few hours/days/weeks ….. 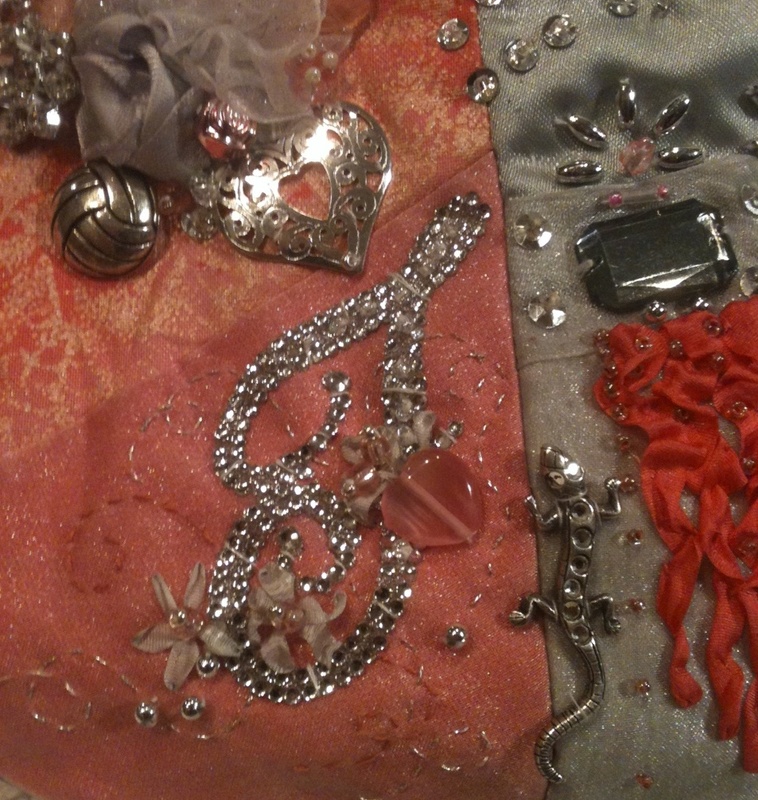 This entry was posted in Crazy Quilting, Embellishment, Purses, Sewing, Sewing for a Teenager, Stash Couture and tagged embellishment, Prom Purse. Bookmark the permalink. 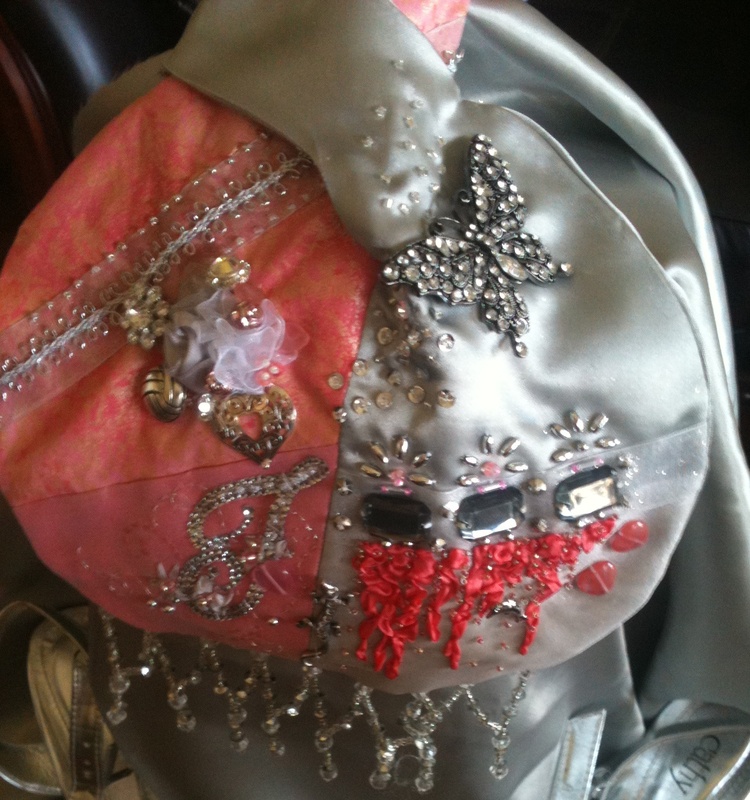 3 Responses to Prom Purse Finished – because time ran out! A magnificent result in a short time! I hope she appreciated the work involved. Both bag and girl looked lovely. the dress is outstanding, the purse took a lot of work for sure. In my day prom dress was 25.00 and mom thought that too much back then, going on 63 I wish I had your daughters dress! Ooohhh . . . pretty!